At Mission CrossFit we believe in “Making the Impossible, Possible!” We believe that anyone, no matter their current physical condition, can be a fit Athlete. That through CrossFit, every one can have a long, healthy, active life, full of rich experiences. We believe that kids love to run, jump, and play, and thus love to exercise and be more athletic. We believe in achieving goals, daily. Mission CrossFit is a licensed CrossFit affiliate that serves the cities of Mission Viejo, Aliso Viejo, Lake Forest, and other neighboring cities in Orange County, California. Our coaches are all certified Crossfit Trainers, each with many years of experience. 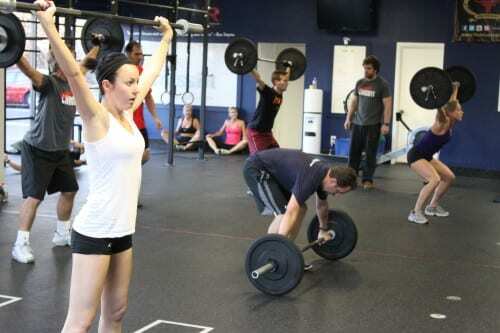 CrossFit uses some equipment and methods that regular gyms don’t. Therefore, the best way to practice CrossFit is at a CrossFit affiliate like Mission CrossFit. We are located in a recently expanded 6400 square foot facility located on the Northwest corner of Alicia Parkway and Via Fabricante, approximately 1 mile east of the 5 Freeway. We take pride in our facility and equipment; as such, it is always in top-notch condition. Most importantly, at Mission CrossFit we have a great time working out and getting fit. If that interests you, then come on in and check us out. We CrossFit because we want to live long, healthy, active lives full of rich experiences. We want to be capable of any task life might throw at us. We want to spend our time on this earth unencumbered by sickness and able to tackle any challenge. That is why we CrossFit, and CrossFit enables every one of those goals. We believe in enhancing an individual’s competency at all physical tasks. Our athletes are trained to perform successfully at multiple, diverse, and randomized physical challenges. Our CrossFit program is distinctive in its focus on maximizing neuroendocrine response, developing power, cross-training with multiple training modalities, constant training and practice with functional movements, and the development of successful diet strategies. With CrossFit, we intend to you make you good at every fitness modality. You might not be the fastest runner or the strongest weightlifter, but you will be fast and you will be strong, making you ready for anything. If you want to know even more about our philosophy and CrossFit specifically, check out our CrossFit 101 article.